Not to be confused with The League of Extraordinary Gentlemen. For other uses, see The League of Gentlemen (disambiguation). The League of Gentlemen is a British comedy television series that premiered on BBC Two in 1999. The show is set in Royston Vasey, a fictional town in Northern England, originally based on Alston, Cumbria, and follows the lives of bizarre characters, most of whom are played by three of the show's four writers—Mark Gatiss, Steve Pemberton, and Reece Shearsmith—who, along with Jeremy Dyson, formed the League of Gentlemen comedy troupe in 1995. The series originally aired for three series from 1999 until 2002 followed by a film in 2005. A three-part revival mini-series was broadcast in December 2017 to celebrate the 20th anniversary of the group's first appearance on BBC Radio 4. The series was filmed mainly in Hadfield, Derbyshire; other locations include Glossop, Gamesley, and Hope Valley in Derbyshire; Marsden and Todmorden in West Yorkshire; and Mottram in Greater Manchester. The series ended in 2002, and was followed by a film The League of Gentlemen's Apocalypse and a stage production The League of Gentlemen Are Behind You! in 2005. Shearsmith and Pemberton later collaborated to create another dark comedy series, Psychoville (2009); Mark Gatiss appeared in one episode. The three also performed together in the fourth series of Horrible Histories, in which they play American film producers who hear movie pitches from historical figures. Shearsmith and Pemberton also wrote and starred in the black comedy anthology series Inside No. 9, which premiered on BBC Two in 2014. The BBC announced in August 2017 that three new episodes would be produced to commemorate the show's 20th anniversary. They aired on BBC2 on 18, 19 and 20 December 2017. The stage show began in late 1994 and it was not long before the team took as their name the title of a Jack Hawkins movie, The League of Gentlemen. In 1997 they were awarded the Perrier award for comedy at the Edinburgh Festival Fringe and their radio series On the Town with The League of Gentlemen, debuted on BBC Radio 4. On the Town was set in the fictional town of Spent. They won a Sony Award for this six-episode run. In 1999 the show moved to television and quickly acquired a cult following; three series were produced, the first airing in 1999, the second in 2000 and the third in 2002. A Christmas Special was broadcast in December 2000, after the airing of the second series. For television, Spent was renamed Royston Vasey - the given name of comedian Roy Chubby Brown, who appears in the series, notably as the Mayor of Royston Vasey in series 2. Along with The Fast Show, the series is credited with the revival of the sketch show format in BBC comedy. Its influence can be seen on later series, particularly Little Britain (the first series of which was directed by Steve Bendelack and script-edited by Gatiss). Filming took place mainly on location in the north Derbyshire town of Hadfield and consequently had no live audience. A laugh track was added to the first and second series, by inviting a studio audience to watch a playback of the completed episodes as well as the filming of certain interior scenes, such as the Dentons'. The laughter track was dropped from the Christmas Special and Series 3 when shown in the United Kingdom. The group took the show on tour for the first time in 2001, using a mixture of old and new material. In early 2005 a special one-off sketch was broadcast on the BBC for Comic Aid, a charity benefit for the tsunami disaster. In this, two of the most popular characters, Tubbs and Papa Lazarou, kidnapped Miranda Richardson. A feature-length film, The League of Gentlemen's Apocalypse, was released on 3 June 2005. Later in the same year, the League toured the UK with their new pantomime-themed show, The League of Gentlemen Are Behind You, which ran from October to mid-December. In September 2006, the unofficial website reported that The League of Gentlemen were to 'reunite' at the beginning of 2007, most likely to plan for the fourth series. Shearsmith and Pemberton appeared on The Russell Brand Show on 22 December 2006. When asked "Will there be any more of The League of Gentlemen? ", Shearsmith simply replied "Yes" but was quick to change the subject and not reveal anything about a new series. On the official website, Shearsmith's blog entry for 23 May 2007 stated that the troupe had recently met up in London's West End: "We discussed our next project - it seems we have hit upon something. Early days - but exciting nevertheless." In May 2008, Shearsmith confirmed that although he and Steve would be making Psychoville (broadcast in 2009) without the other members of the League, the League would re-unite in the future. Despite this claim, Gatiss appears in the show as an actor who is murdered by the characters played by Pemberton and Shearsmith. In 2010, a one off radio show, The League of Gentlemen's Ghost Chase, was broadcast on 28 October for Halloween. Unlike other shows, this was not a scripted dark comedy but a documentary of the members spending a night at The Ancient Ram Inn, reputedly the most haunted hotel in the country. Speaking to BBC Radio 6 in October 2016, Mark Gatiss spoke about the desire of the creators to bring back the show in some form with Brexit forming a suitable background to revive it. In April 2017, both Gatiss and Shearsmith confirmed that the show would be returning for an anniversary special. The BBC announced in August 2017 that three special new episodes were to be produced, to be aired in December 2017. In the radio series, the plot involved outsider Benjamin Denton visiting his aunt and uncle in Spent to be interviewed for a job at the local power plant. Not surprisingly, he missed the interview and was forced to stay longer than expected. In the first television series, a sketch show, the story opens by revisiting the arrival of Benjamin Denton in Royston Vasey at the home of Uncle Harvey (who has a preoccupation with toads and domestic cleanliness) and Auntie Val. Another main plot involves a new road being built through Royston Vasey, raising the possibility of a great numbers of strangers visiting the town, a fact which terrifies the owners of the local shop, Edward and Tubbs, who are determined to keep the shop "local" and protect "the precious things". The road development ends when Tubbs and Edward discover that the construction manager is their long lost son, David, and convince him to end construction and live "locally". A third thread follows Pauline Campbell-Jones, the local Restart officer with a pen obsession and utter contempt for the attendees on her Restart course, and her fall from grace at the hands of her malevolent colleague, Ross, who poses as a course attendee. Guests in series 1 include Don Estelle, playing the role of the Royston Vasey zookeeper, whose zoo is located on a traffic island (until the animals go missing). The second series sees a deadly epidemic of nosebleeds grip the town's inhabitants, killing many. The series concludes after some confusion over the cause of the nosebleeds, involving butcher Hilary Briss's "special stuff", Benjamin Denton's escape from his Uncle Harvey and Auntie Val (aided, unexpectedly, by his young cousins, Chloe and Radcliffe), Pauline Campbell-Jones's revenge on Ross, and the murders in the Local Shop. The first episode of this series contains the debut of Papa Lazarou, a character in blackface who (despite only appearing in four episodes) quickly became one of the show's most popular characters. Tubbs and Edward, seeking a partner for their son, David, who they are now keeping captive above the shop, persuade village transsexual taxi driver Barbara to marry him. At the conclusion of the series, the townsfolk, mistaking the source of the "special stuff", free Barbara and burn down Edward and Tubbs' shop. Guests in series 2 include Sian Gibson (as Sian Foulkes) and the comedian Roy Chubby Brown, in the role of the Mayor of Royston Vasey. As noted above, the town of Royston Vasey is actually named in tribute to Roy Chubby Brown, that being his actual birth name. The third and final series focused on a different character each week but with the overlaps creating a more complex layering of the plot, more akin to a one-off episode of a situation comedy (albeit with intertwined plots) than a traditional sketch show. The end of each episode features a white van swerving to avoid a pedestrian and crashing into a garden wall. Some residents escape unharmed, while others are not so lucky. A red plastic bag (which is viewed as a sign of imminent death) is seen being blown by the wind through the town in every episode, indicating that all the stories occur simultaneously. Guests in series 3 include Sian Gibson (as Sian Foulkes), the designer Laurence Llewelyn-Bowen, Christopher Eccleston and a very young Brooke Vincent, later to become a regular in Coronation Street. The 2000 Christmas Special, "Yule Never Leave!" took the slightly different format of three self-contained stories, with three of the characters seeking the help of the vicar, Bernice, on Christmas Eve. The first story features Charlie and Stella Hull, the warring couple from series 2. The second concerns the backstory of Herr Lipp and his wife, Lotte, in Duisberg, in the years before Herr Lipp visits Royston Vasey. The third is a Victorian tale, telling the story of how Dr. Edmund Chinnery comes to be in Royston Vasey and of the curse that is placed on Chinnery and his descendants. A postscript tells of how vicar Bernice, as a small girl, was abducted by Papa Lazarou and ends up with the adult Bernice being visited by and kidnapped by Papa Lazarou, on Christmas Eve. This episode was aired between Series 2 and Series 3 and features guest appearances by Liza Tarbuck and Freddie Jones. In August 2017, the BBC announced that three new episodes would be produced to mark the twentieth anniversary of the show's debut on BBC Radio. Filming for the specials took place from late September through mid October 2017, with guest star David Morrissey on set with the cast. On 24 October 2017, the first official image confirmed the return of Pauline Campbell-Jones, alongside Ross and Mickey. On the same day, it was announced that a special screening of one of the episodes would be taking place at the British Film Institute on 12 December 2017. The central plot sees Royston Vasey's existence threatened by boundary changes. Bernice, having escaped from Papa Lazarou and now elected as the mayor, launches a campaign to save the town after learning she will lose some of her privileges. One of the councillors behind the move and a local journalist are taken hostage by Tubbs and Edward, who have survived and have set up a shop in flat No. 9 of an abandoned block of flats, and demand that no changes are made. The story spreads nationally, with the Prime Minister agreeing not to change the boundaries. But Tubbs and Edward are forced to flee when it is revealed that they have cut off the faces of their hostages. Fleeing the police, Tubbs hides in a photo booth with a trap door, which opens and kidnaps people when a photo is taken. 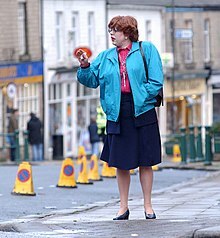 Bernice later reveals that the land on which Royston Vasey lies has been sold for fracking, because she was allowed to escape from Papa Lazarou only by agreeing to sell the land to him. The photo booth is revealed to be one of Papa Lazarou's traps, who then appears before Tubbs saying: "It's a wife mine now." The League of Gentlemen have played in total nearly a hundred characters, many created in the early stage shows, others during the span of the television series and some especially for the team's film. Most of the characters live in Royston Vasey. It is widely believed that a lot of the characters and indeed the town are based on Pemberton's home town of Chorley, with Royston Vasey based on Adlington, a village within Chorley Borough. The character of Herr Lipp is believed to be based on a hospital chaplain Steve Pemberton encountered after suffering a heart attack in Germany and Pauline is primarily based on a restart officer of Reece Shearsmith's. Similarly, Ollie Plimsolls is based on a community theatre actor that Shearsmith had worked with. In the DVD commentary on the second series, Pemberton and Shearsmith state that Papa Lazarou's speech patterns are based on their former landlord, who would phone their flat and insist on speaking only to Steve. Gatiss has said in interview that the local shop was inspired by a shop in the village of Rottingdean and that he was influenced growing up around the former Winterton Hospital asylum near Sedgefield. The majority of the inhabitants of the village — male and female — are played by Reece Shearsmith, Steve Pemberton, and Mark Gatiss, and the script was written by these three, along with Jeremy Dyson. Dyson, not an actor like the others, appears only in cameo roles. As there are usually only three actors on screen at any one time, the different characters mostly play out their own stories in several serialised sketches, rarely crossing into each other's storylines. Only rarely do actors "meet themselves". Exceptions include Papa Lazarou facing the Reverend Bernice in the Christmas Special (both Reece Shearsmith), Les McQueen buying a magazine from Pop's son (both Mark Gatiss), and Alvin Steele buying food from Iris at a supermarket checkout in Series 2 (again, both Mark Gatiss). The idea is taken further in The League of Gentlemen's Apocalypse, when the characters meet the actors (especially when Herr Lipp meets his creator, Steve Pemberton). In the live shows, when Pam Doove was auditioning for a part in the Christmas Nativity Play, directed by Ollie Plimsolls, Pam had to audition in front of Ollie's Legz Akimbo colleague Dave (Pemberton), who said that Ollie couldn't make it "for obvious reasons" (Shearsmith plays both Pam and Ollie in the television series). The film was made in 2005. The plot is that Royston Vasey is coming to an end and that the locals appear in the real world to try to save it. In the beginning Jeremy Dyson is killed by Tubbs, Edward, and Papa Lazarou. The show features sketches that act as a continuation from the revival, such as Edward's mission to find Tubbs, which ends in him finding the wife mine and rescuing her. Papa Lazarou attempts to stop them, but Edward destroys the mine with Lazarou still trapped inside it. A sketch also reveals that Pauline faked her dementia as well as her murder in order to get an insurance claim, and moves to France with Mickey to enjoy their fortune. In 2003, its creators were listed in The Observer as among the 50 funniest acts in British comedy. In 2004 The Radio Times listed Papa Lazarou as the 8th funniest comedy sketch of all time. The series was cited as an inspiration for the later Canadian television series Death Comes to Town, a reunion project for the Canadian sketch comedy troupe The Kids in the Hall. ^ The League of Gentlemen: Scripts and That. London: BBC Worldwide. 2003. ISBN 0-563-48775-5. ^ "The League of Gentlemen to make TV comeback, writer announces". Lancashire Post. ^ a b "BBC Comedy Map – Series 1: The West – Birmingham to Manchester". bbc.co.uk. BBC Online. Retrieved 29 March 2013. ^ "Why did the League of Gentlemen choose to reform on Horrible Histories?". RadioTimes. ^ a b c "Patrick Holland announces range of new titles for BBC Two". BBC. ^ "'League of Gentlemen' revival and 'Alan Partridge' documentary among BBC highlights for Christmas 2017". 28 November 2017. Retrieved 20 December 2017. ^ "The League of gentlemen Web site Latest News about The League of Gentlemen by Jason Kenny www.xshot.co.uk". Leagueofgentlemen.co.uk. Retrieved 2009-03-16. ^ "Blog | This Is A Local Shop - The Official League Of Gentlemen Web site". This Is A Local Shop. Archived from the original on 19 December 2007. Retrieved 16 March 2009. ^ "BBC Radio 4 - The League of Gentlemen's Ghost Chase". BBC. ^ Jackson, Jasper (2016-10-13). "Mark Gatiss: League of Gentlemen star hints at 'Brexity' return to TV". The Guardian. ISSN 0261-3077. Retrieved 2017-01-13. ^ "The League of Gentlemen is making a TV comeback". ^ "Revealed: Film locations and dates for the League of Gentlemen". The Huddersfield Examiner. ^ "Mark Gatiss and his League of Gentlemen have finished filming". Radio Times. ^ "'The Walking Dead' star joins 'The League of Gentlemen' revival". NME. ^ "First Image From New Series of The League of Gentlemen". Beyond The Joke. ^ "You ask the questions - Profiles - People - The Independent". The Independent, London. 2000-10-04. Archived from the original on 2015-03-07. Retrieved 2015-03-07. ^ Close (2001-02-10). "Interview with The League of Gentlemen | From the Guardian | The Guardian". London: The Guardian. Retrieved 2009-03-16. ^ "Renaissance gentleman". The Sunday herald. 2004-11-07. Archived from the original on 2009-06-28. Retrieved 2009-04-08. ^ The Kids in the Hall: Death Comes to Town Archived 17 January 2010 at the Wayback Machine. twitchfilm.net, 12 January 2010. The League of Gentlemen Website! derbyshire|Hadfield, Glossop, Derbyshire, England, SK13 1 Link to map of Hadfield, where most of the series was filmed.